Thermoforming is widely used to produce packaging in the food industry. 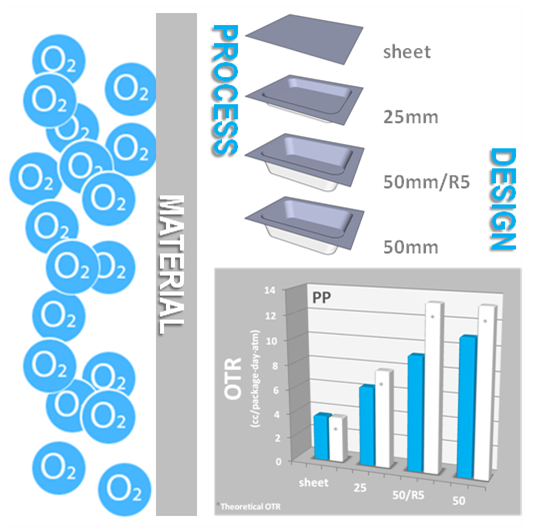 The Flanders' Food (FF) project MaProDe_Ox shows that the thermoforming process has a great impact on the oxygen barrier of the packaging materials. Choice of the material, deep drawing depth, straight or rounded corners have a great impact especially when packaging under modified atmosphere is considered. DPXB Series Thermoforming action is done by vacuum assisted with air pressure (up to 2 bars). Forming is always below the material line, being maximum forming depth 60 mm. Forming platens have a closing force og 18.5 kN. Lower platen is motioned by a vertical pneumatic cylinder in combination by a mechanical toggle system. This forming process is usually used in combination with plug-assist forming. This technique distributes the material more evenly over the mold thus achieving deeper draws. For this research, the researchers from IMO-IMOMEC of the Packaging Centre and Applied and Analytical Chemistry of the University of Hasselt worked intensively with 11 companies from the food and packaging industry and Pack4Food. The results of this applied research were published in 2014 in Polymers. The results were integrated into the MaProDe_Ox tool which is available on the website of the Packaging Center. In a few clicks, the effect of the deep drawing on the material dilution and the oxygen transmission rate (OTR) is given for the selected packaging materials. 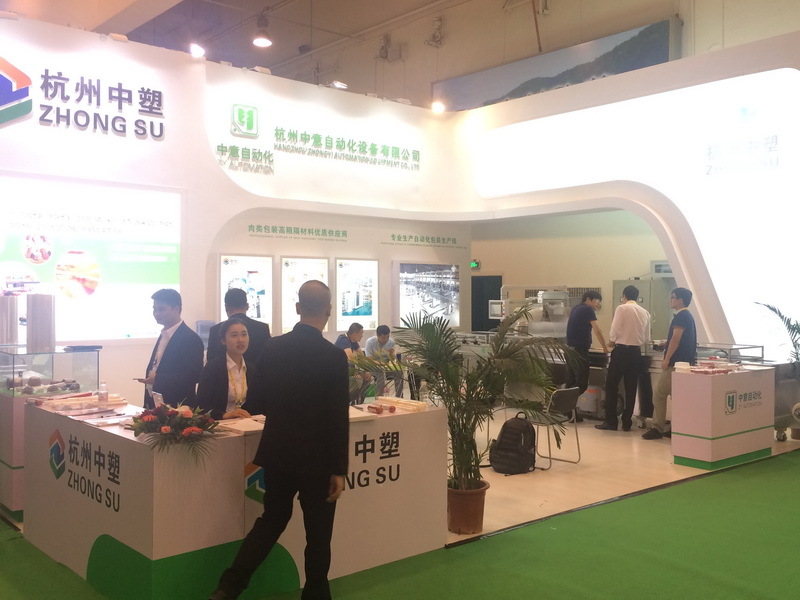 The mono- and multilayer materials, PP, PP/EVOH/PP, PS/EVOH/PE, APET/PE, APET/PE/EVOH/PE, PA/PE and (PE/)PA/EVOH/PA/PE were extruded in two different thicknesses and then thermoformed into trays with the same size but with variable depth and variable radius of the corners. In the MaProDe_Ox tool it is possible to choose for any material a specific design (i.e. 25 and 50 mm deep with right angles or 50 mm depth with rounded corners for the thin materials, and 50 and 75 mm deep for thicker materials). Further, the measured percentage dilution of the material is visually shown as well as the measured OTR expressed in different units that are relevant for the comparison of different sheets and packaging (i.e. cc/[m2.day.atm], [cc.20µm]/[m2.day.atm] en cc/[pkg.day.atm]). In addition, the OTR of the trays is also calculated on the basis of the OTR of the sheet, and assuming a homogeneous material distribution. Subsequent investigation showed that this theoretical value can be used as a rough approximation for most of the materials. However, detailed analysis of crystallization and unequal thinning, which is also related to the tray design, remains necessary to explain the deviation of the measured OTR as compared to the predicted one. Currently the IWT TETRA project OptiThe_Ox2 is running which sets the trends of the FF project further. This study focuses on the material thickness and OTR before and after thermoforming of new film materials in simple, but also in more complex trays with ribs. In addition, the effect of heat treatment on the OTR of selected trays is studied and additives with potential impact on the OTR are screened.